The Vestfold summer house at Norway is designed by Jarmund/Vigsnæs AS Architects. This house has a bold and strong looks imitating the strength of the rocky landscape. Jarmund/Vigsnæs AS Architects has created a building that becomes one with the surrounding area. 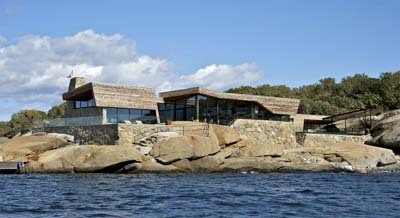 The Vestfold house has a stone wall barrier as a perimeter base and the main building has a balance combination between the massive wall and the glass window opening. Some parts of the building is designed to protect the house against the wind, that’s why they designed an elongated volume and using a glass fence as a barrier. The glass material is used to gain a maximum view to the beautiful waterscape and landscape. To add a strength to the building they clad kebony wood so the house has more shield against the salt water. The most exciting process is using stone for the walls by blasting at the site so there is less waste and budget. Vestfold summer house is an example of good environmental architecture.